Sugaring and psoriasis: for or against? Home » BLOG » Sugaring and psoriasis: for or against? 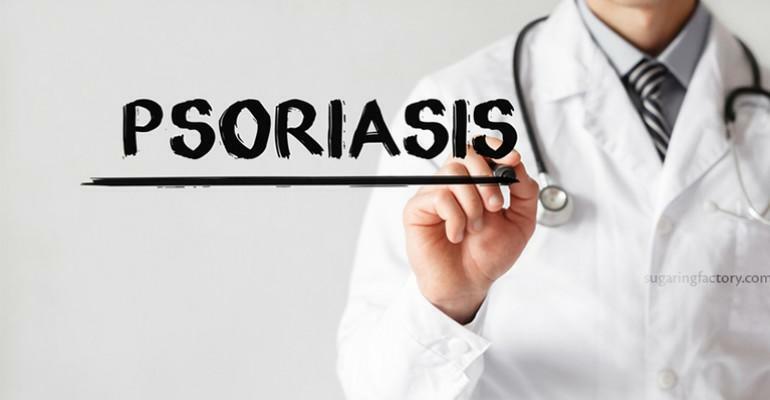 Many skin diseases, one of which is psoriasis, is a contraindication to a number of cosmetic procedures, including hair removal. And sugaring is a real salvation in this situation! A woman who has an autoimmune dermatological disease does not have to deny herself a sugaring procedure to remove unwanted hair. The use of sugar paste hair removal is possible both for people with psoriasis and eczema. The only contraindication is performing sugaring at home. Unqualified and poorly performed procedure can lead to skin problems. Therefore, it is better to make an appointment with a professional. Before the procedure, it is also highly recommended to visit a dermatologist and make sure that there are no contraindications for you personally. • Itching and burning sensation. These manifestations have a typical localization and most often develop on the body, in the area of skin creases and on knees and elbows. Performing sugar epilation is contraindicated in patients with psoriasis during exacerbation of the disease. In this case, an erythema appears on the skin: it’s adischarge of the serosanguinous fluid from the damaged skin. In other situations, sugaring does not affect the course of the disease in any way and does not worsen the patient's condition. Exfoliation has a beneficial effect on the skin condition, the skin becomes not only smooth and silky, but also looks healthier. Removal of hairs and dead skin cells speeds up repair processes. Lemon juice, added to the sugar paste, improves penetration of beneficial components deep into the skin, toning and restoration of the skin occurs. Therefore,sugaring is beneficial for people with psoriasis.